DIX, May 25—An early morning search of a Dix town residence last week is being called the biggest methamphetamine drug bust in the state by authorities. District Attorney Joseph Fazzary said the raid was accomplished by a task force consisting of his office, the Watkins Glen Police, state police, Schuyler County Sheriff’s Office, and the federal Drug Enforcement Administration. According to a press release from the sheriff’s office, authorities obtained a search warrant for 1334 Roloson Hollow Road, Dix, last Wednesday, May 18. Authorities said the search uncovered some 21 kilograms of methamphetamine, or around 62 lbs., plus 450 lbs. of methamphetamine oil solution. He explained the various law enforcement members assembled at the Dix Fire Department at 5 a.m. that morning. 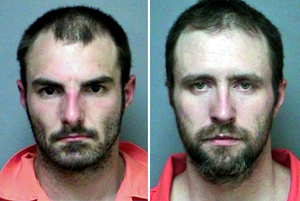 He said that just after 6 a.m. they started the search and found an active meth lab and arrested three persons: Chad T. Speicher, 27, Shawn P. Rickard, 38 and John A. Barton, 30. Fazzary added Barton rented the property from a farmer who lived down the road. The report said the three were charged with criminal possession of a controlled substance in the first degree, a class A-1 felony. He explained if convicted by the state, they could each get between eight and 20 years in prison. Fazzary added in a federal court the penalty is as high as a lifetime in prison. Fazzary said authorities seized around 21 kilograms of meth, as well as 18 guns, eight motorcycles, five all-terrain vehicles (ATVs), about $10,000 in cash, and other drugs like marijuana and mushrooms. He added the vehicle identification number (VIN) on one ATV was removed, which is also a crime. Authorities said the investigation was started by the task force several months ago based on the sharing of information. “We have a very active, small drug task force,” he said. Fazzary said the agencies do drug sweeps once or twice a year. He said the task force focuses on arresting the dealers, while the main drug of interest is methamphetamine. “Our information tells us it’s a huge problem,” he said.